An Episode In The Life Of An Iron Picket (2013) – Danis Tanovic. Communities that live on the fringes of modern society have always had a particular interest to a certain breed of filmmakers. Ken Loach focuses on some aspects of this in his work while Pier Paolo Pasolini positively insists on involving isolated and under-represented groups of people, whether within his narratives or in the production of the films themselves. Even last year’s Sight & Sound best film winner, Joshua Oppenheimer’s The Act of Killing (2012), sought to address this point but also opened up the area that is the main focus of this essay; that of the blurring of reality and fiction by using people to reenact their own history – a trait that defines Danis Tanovic’s latest film, An Episode In The Life Of An Iron Picker (2013). It begs the question, why do directors insist on wanting to muddy the water of this delineation? After all, documentary films of the more traditional show-and-tell variety still in some way create a fiction and dramatise events that no doubt seemed far less exciting and dangerous to the people it actually happened to. Yet Iron Picker represents a fashion in dramatic documentary that is becoming more and more present, allowing drama to be received by the viewer without them actually knowing how much of what is there is actually true. Whilst Tanovic’s drama is clearly born of truth and given even more of the edge of harshness by using documentary aesthetics and non-professional performers, it plays on the relationship in such a way as to be seen as provocative. Iron Picker follows the tragedy of Nazif, an iron picker from a Roma family in the cold, snowy straits of Bosnia-Herzegovina. Whilst his monotonous life has clear and ample scope for a transcendental drama à la Béla Tarr, Nazif’s life has a more dramatic tragedy for him to face; that of the barriers surrounding the health system of his country as his pregnant wife becomes ill and desperately in need of surgery. Tanovic makes sure that Nazif’s world is one that is shown to be already difficult, almost to heighten the sense of hopelessness of the situation he finds himself and his family in. His world is one of taking apart cars, literally smashing them to pieces with very basic tools in order to sell the metal to a scrap dealer. The film reminds in some ways of the work of Sergei Loznitsa. The snowy, eerie vistas filled with barren, torn apart vehicles recalls In The Fog‘s iciness (2012) whilst the film’s more ethnographic qualities feel similar to Loznitsa’s documentary, Landscape (2003). However, Tanovic has more of a philosophical agenda here than to simply document and it’s telling that he opts to dramatise and recreate with the actual people rather than simply relate and recall. By using the people in the way he does, Tanovic creates a genuine sense of despair in the character’s reaction; the very earnest idea that Nazif’s wife should not die simply because of money is one that any morally sane person can understand and stand alongside firmly with. While relaying this true story, there is a great sense of anger behind the direction. Iron Picker, in spite of being relatively short at just under seventy-five minutes, has a determined sense of speed and passive aggressiveness as if Tanovic is shouting at the hospital representatives for their obsession with procedure as opposed to the care of patients and of people. It’s not hard to sympathise, especially when a doctor later berates the husband for not bringing his wife in early in the illness adding easily to burning anger at the system. With all of its layered sense of grief, both unspoken and suppressed, there are moments in Iron Picker that are surprisingly bright. Perhaps they seem brighter because of the inherent sense of bleakness but Nazif’s two daughters provide some much needed humane relief. They spark and fritter about the various rooms of the film, seemingly positive and energetic in spite of being surrounded by a desperate poverty. One daughter’s particular insistence on catching up with “her series” on television, which seems to override just about everything within her reality, is utterly charming and unknowingly resilient. Outside of these moments though, the film rarely looks to a bright future. Whilst being largely occupied with finding the money and the insurance to cover his wife’s operation, Nazif is ultimately shown to be stuck in a situation that well exceeds his power of change. If described in basic terms of happening, Iron Picker could be said to have a happy ending. 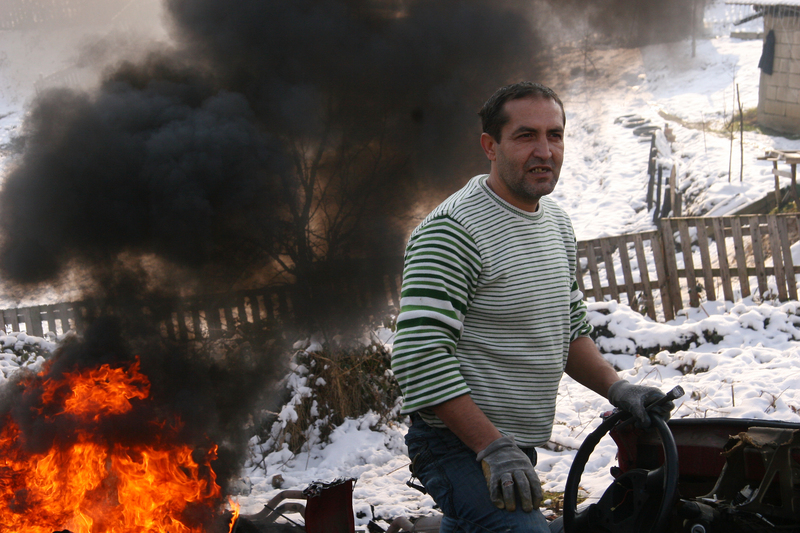 Tanovic knows that this is not the end of the family’s problems though and makes sure that the viewer is acutely aware that Nazif’s toil will continue as he goes back outside into the snow to chop up some more wood for the gradually diminishing fire. 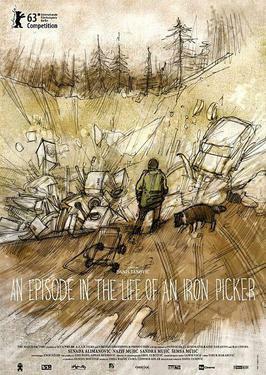 An Episode In The Life Of An Iron Picker is released on DVD by New Wave Films on the 14thof July 2014. Trailer – The Coastal Path. Jodorowsky’s Dune (2013) – Frank Pavich.